All you have to do is go to the Snow Forts and go at the right side of the clock. Your phone should start ringing. The puzzle is very easy. 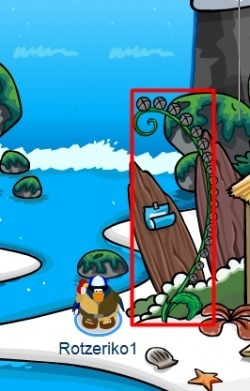 You only have to approach the microphone and then the EPF phone should start ringing. 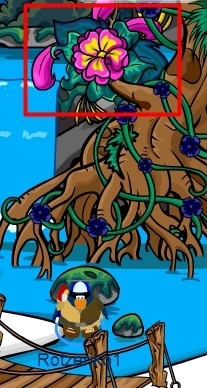 The EPF puzzle is extremely easy to solve. To find the Candy Apple Pin go to the Hidden Lake. The new Field Op is located at the lodge attic. Step to the red cough and the Spy phone should start ringing. Then solve the problemthat is the same as the previous field op's and you 're done! New Field Op is here! 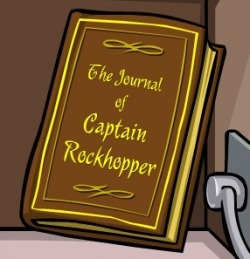 The new Field Ops is located at the Mine, and not at the Lighthouse because of the words of the EPF message that says:"...near a big light bulb." Adventure Party Boat Hunt and Free item cheats! After you find them you click build map in the window of the hunt that appears. When you build it (it's easy) you can take the backround! Congrats! You now have all the free non member items! There is also a member item located at the big tree in the forest. 1. Hit the target with a snowball to make this screen appear. 2.Walk to the green square. 3.Run to the red square. 4.Move away from the red square. 5.Hide behind the pillar the red square was. 6.Don't move to the blue square. 7.That's It! 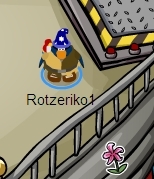 You are an EPF Agent! 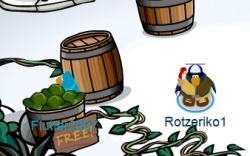 Snow Maze party is designed only for members but club penguin after the non members' protest made a free item for them too. Despite that, the party room can't be accessed from them. 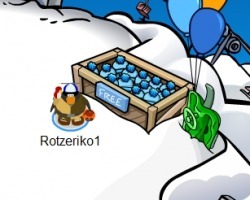 The free item for all penguins, the "Blue Pompom Toque" is located on the mountain. Use this map to find you way to the end. Then, it is time for the prize, the "yeti costume". You must throw a snowball there. The rooms that are only for member! The new pin is in the cove! No Cheats on the Sports Catalog! It is very strange but there aren't hidden items on the sports catalog as we are not the only ones that can't find them. To get the blue viking helmet click on and off the piano 4 times. To find the sailboat pin you have to go to the coffee shop. To find the old ruby pin click the items in the stage as in the picture. Then click the safe behind the painting. 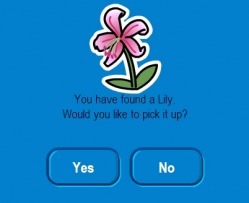 Finally, click the pin to get it. To get the Sensei's Autograph without finding him put "9036" on the perm item box on penguin storm. 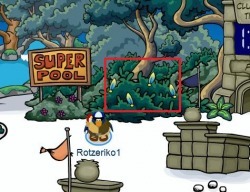 The new pin is at the cave(pool) under the plaza. 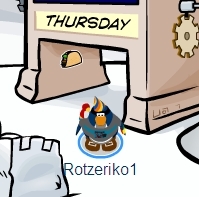 To find the BLUE Viking helmet cheat click on and off the RED Viking helmet times! 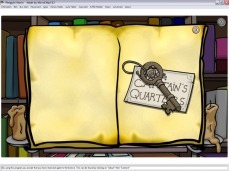 Adventure Party free item cheats! 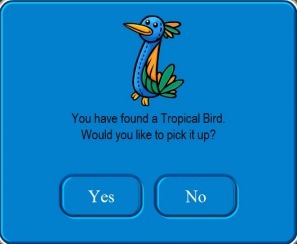 To find the green safari hat go to the plaza. 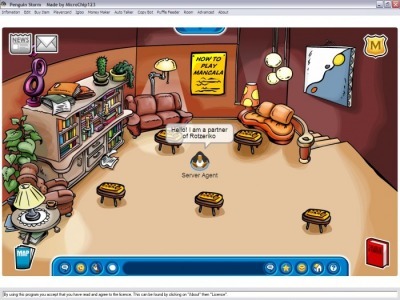 For the Adventure party Backround follow the steps or enter the id 9030 on penguin storm. You can do this voise when you press ET but no on chat bar! You can open and close the bulb of lighthouse with a click on the switch! You can see you can see old things and old parties, rooms, newspapers etc. 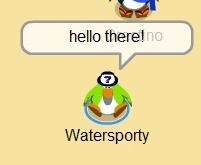 from club penguin with a click here! 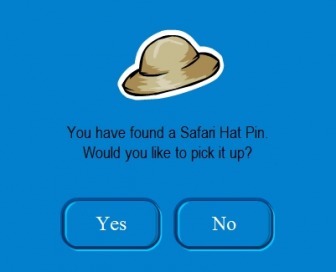 Safari Hat pin and its mystery! 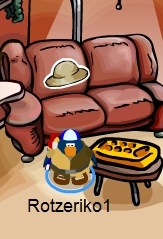 3.Click on the hat on the couch. To find the GOLD Viking helmet cheat click on the helga's Viking helmet after you have opened the BLUE Viking helmet! It is in the Lighthouse(as the previous year's)!!! 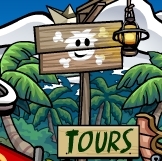 It is located at the Ski Lodge Attic in the Ski Village. Sounds like something surprising is going to take place at the April Fool's party! It is at the coffee shop! And guess what! 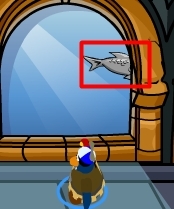 It is old, that means it is not the first time it comes on stock in club penguin. And there aren't any other free items for non members. Unfair! WE ALREADY HAVE IT YOU FOOLS!!! 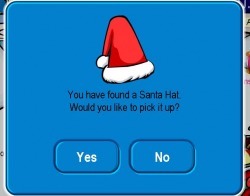 Some new items come out in every party of club penguin. Some?? No, there is only one!! 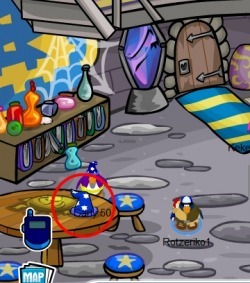 !I will kill cp! To get it go to the dock. 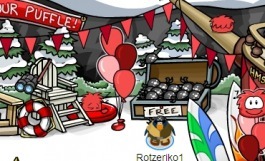 It is named "Puffle Bandana"
Box O' Puffle O's Pin Cheat! 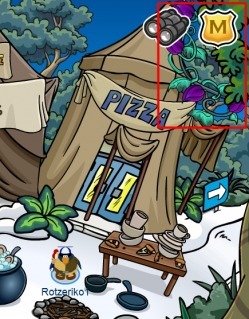 The new pin is located at the Mine shack. Walk under the lamp to pick it up. 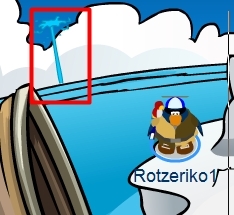 The new pin is located at the top of the Lighthouse. 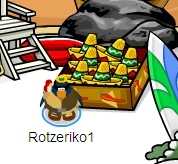 You can find a mini Sombrero at the cove. There is only one free item but at least it is new! Dance Contest expert mode cheat! 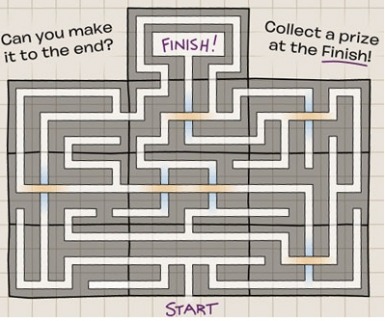 2.When it says to choose the difficulty, click the Cadence's head. 3.Now you can play the expert mode! 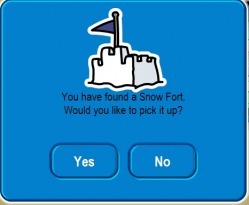 The new pin is located at the snow forts, under the Club Penguin Clock. 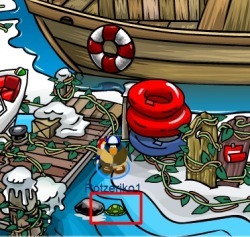 Gingerbread man and Present pin both on club penguin! 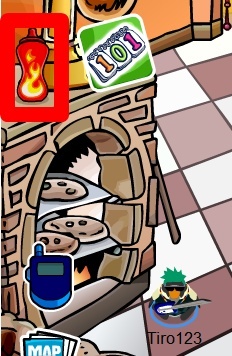 Gingerbread man, the new pin, is located at the Lodge Attic while the present pin is still at the fireplace of the Ski Lodge! Check it out by yourself! 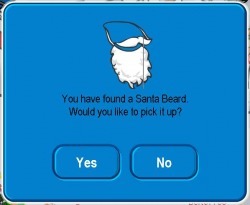 Note: Some penguins can't see the present pin. 4.Now you can use your pin!!! 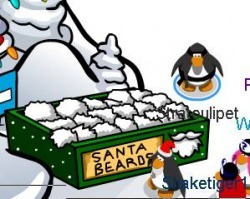 You can get the Santa Hat by going to the Snow Forts. 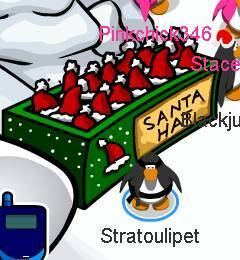 Also you can find a Santa Beard at the Ski Village. 1.Go to the library in the coffee shop. 3.Then click to the big brown book. 5.Now you can go to the ship quarters!!! 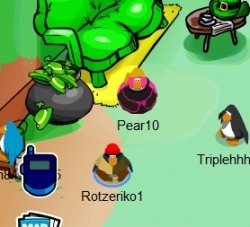 Coins for Change is something like a club penguin organisation which helps the children in the poor countries.You can donate money in the plaza or in the beach and pick up a bell. 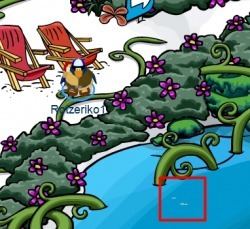 To find the red sailor's cap go to the Migrator.